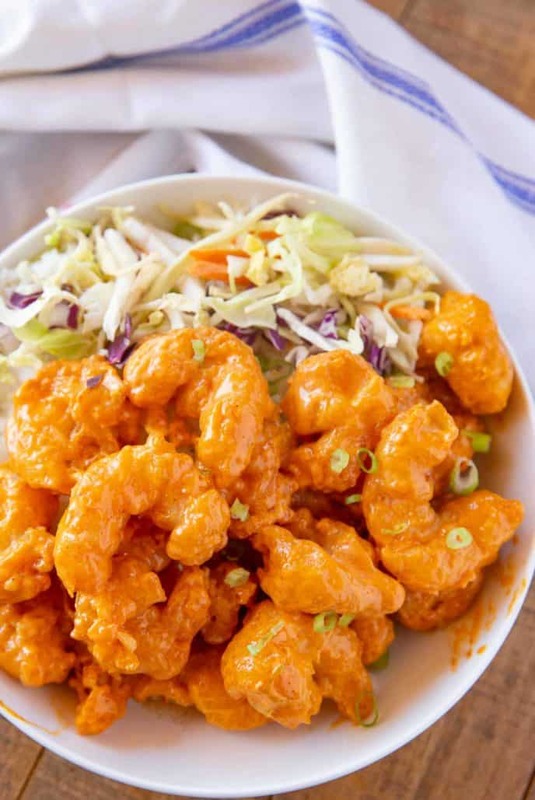 Dynamite Shrimp made with battered fried shrimp coated in a spicy mayo sauce is the PERFECT recipe to serve as an appetizer or the main course! 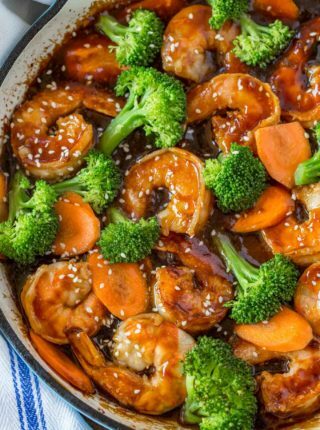 We’re adding another Asian shrimp dish to our recipe book, along with our favorite Bang Bang Shrimp, Shrimp Tempura, and Easy Shrimp Stir-Fry! 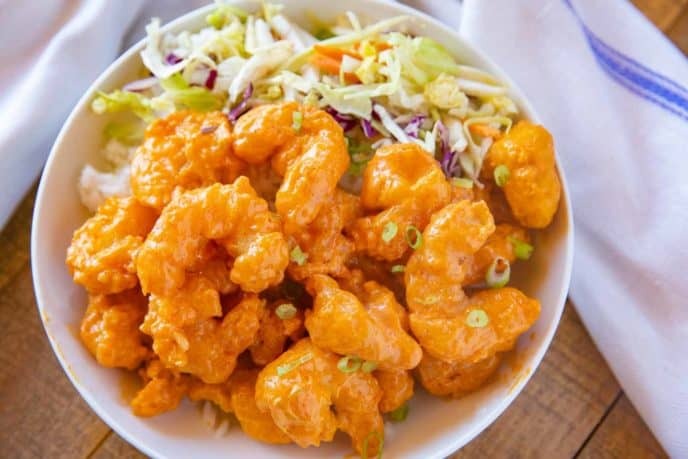 Dynamite Shrimp is one of my favorite things to order when we go out to a Japanese restaurant, usually as a side dish or an appetizer. It’s surprisingly easy to make right at home! 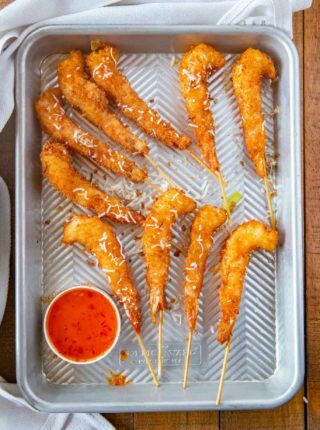 This shrimp is dredged in flour and then batter, then fried and coated with a spicy mayo sauce. 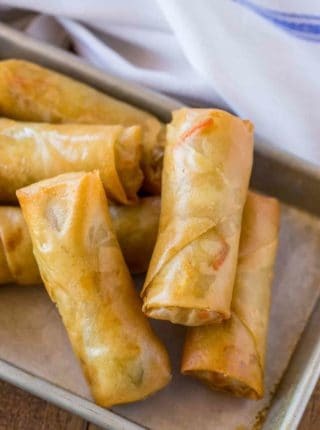 You can serve dynamite shrimp with a few more of my favorites, like Egg Rolls, Potstickers, Crab Rangoon, or Sweet and Sour Sauce! HOW LONG DOES DYNAMITE SHRIMP KEEP? This homemade shrimp recipe will keep in the refrigerator for for 3-4 days. Be careful not to overcook the shrimp when you reheat it. Because this is a deep fried food that has been tossed in sauce the shrimp will be soggy and the sauce will have soaked into the breading. To reheat properly you should place the shrimp into a toaster oven to crisp then make an additional amount of topping. It will be more oily due to the soaked in mayonnaise but the crispy texture should mostly return. 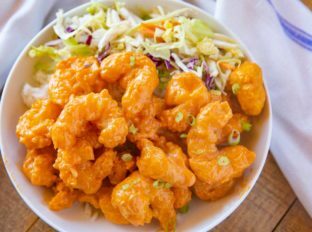 CAN YOU FREEZE DYNAMITE SHRIMP? I do not recommend freezing dynamite shrimp, because cooked shrimp has a tendency to get rubbery when you do. If you want to prep this recipe ahead, you can mix the flour together and seal it tightly in a plastic bag, and whisk together the sauce and store it in the refrigerator. Then all you have to do is dredge and fry the shrimp when you’re ready! Whisk well until combined and refrigerate for at least one hour. 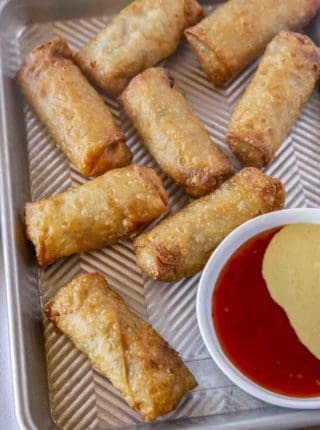 Bang Bang sauce is made with only 3 ingredients, so it’s probably the easiest part of this dish. Simply whisk together the sugar, sriracha, and mayo until it’s well combined and refrigerate. You can serve this dish with extra bowls of sauce, too. Technically, shrimp and prawns have a different amount of claws and a slightly different body shape. But when it comes to cooking, there’s not really a difference, and you can use either for a recipe like this. Add more ingredients like minced garlic to the sauce, or add cayenne pepper to the flour for more heat. Add this on top of steamed rice for a shrimp bowl lunch or dinner! Garnish with chopped chives or diced green onions for presentation. Add a few tablespoons of panko breadcrumbs to the flour for an extra crispy texture. Make this sauce with 1/2 cup mayonnaise, and 1/2 cup pureed avocado to add some healthy ingredients to the sauce. If you don’t have sriracha, you can try adding hot sauce instead, even though the flavor will be slightly different. Serve the shrimp with sweet chili sauce, because the sweetness will help cut down on some of the heat for anyone who doesn’t love spicy food. Heat a pot of oil to 375 degrees, at least 3 inches high. Mix together the flour, cornstarch, baking powder, salt and pepper then dredge the shrimp in it and dust off the excess amount. Whisk the club soda into the flour mixture then dip the shrimp into it and fry them immediately until golden brown, about 2-3 minutes. Whisk together the mayonnaise, sugar and sriracha and toss with the freshly fried shrimp before serving. I am sure my husband will love this! Looks amazing! This dish is always a winner! A must try recipe for sure! Oh my this takes shrimp to a whole another level Thank you!! So glad you enjoyed it, Jade! I appreciate the 5 stars.